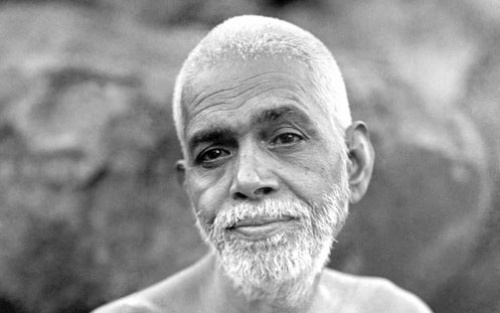 When devotees asked Ramana Maharshi the interpretation of some of the verses of Aksharamanamalai which Ramana himself had composed in praise of the Arunachala mountain, his abode, Ramana replied: "You think it out and I will too. I didn't think while I was composing it; I just wrote as it came." Two great men on the past century – Mahatma Gandhi and Bhagavan Ramana Maharshi - walked the planet together but never met each other in person. A few stories about the Mahatma and Bhagavan below tell us how their inner fields converged despite visible superficial differences in the ways in which they contributed to the world. Once, Dr T. N. K., one of Ramana’s followers, brought news that the Mahatma told people that he was frequently thinking of Bhagavan and had great reverence for him. To which, Bhagavan said, ‘Yes. Yes. That may be so. Whenever anybody tells him he has no peace of mind, he packs them off here, telling them, “Go and stay at Ramanasramam for a time”. Question: If independence is gained after a long struggle and terrible sacrifices, is not the person justified in being pleased with the result and elated by it? Bhagavan: He must have in the course of his work surrendered himself to the Higher Power whose Might must be kept in mind and never lost sight of. How then can he be elated? He should not even care for the result of his actions. Then alone the karma becomes unselfish. Question: Should we not know if our actions will be worthwhile? Bhagavan: Follow the example of Gandhiji in the work for the national cause. ‘Surrender’ is the word. Bhagavan’s approval of Gandhi’s state and his consequent lack of ‘motivation’ was clearly brought out in his comments on two paragraphs that Gandhi had written in The Harijan about a trip he took to Rajkot: ‘How mysterious are the ways of God! This journey to Rajkot is a wonder even to me. Why am I going, whither am I going? What for? I have thought nothing about these things. And if God guides me, what should I think, why should I think? Even thought may be an obstacle in the way of His guidance. ‘The fact is, it takes no effort to stop thinking. The thoughts do not come. Indeed there is no vacuum - but I mean to say that there is no thought about the mission.’ On reading this, Bhagavan remarked how true the words were and emphasised each statement in the extract. In the 1930s, Mahatma Gandhi came to Tiruvannamalai to make a political speech. Since the organisers had selected a piece of open ground about 400 yards from the ashram as the location for the event, many people in the ashram had hopes that the Mahatma would also pay a call on Bhagavan. When the day of the speech came, Annamalai Swami, one of Bhagwan’s followers, along with many other devotees, waited at the ashram gate in the hope of catching a glimpse of Gandhi as he drove past. When he finally passed the ashram, he was very easy to spot because he was being driven to the meeting in an open car with Rajagopalachari, a leading Congress politician, next to him. As the car was moving very slowly, Annamalai Swami ran alongside it and saluted Gandhi by putting my palms together above his head. To Swami’s astonishment and delight, Gandhi returned his greeting by making the same gesture. The car stopped for a few moments near the ashram gate but it started again when Rajagopalachari gestured to the driver that he should drive on and not enter the ashram. One of the ashram’s residents, T. K. Sundaresa Iyer, went to the meeting and presented Gandhi with two books: one of them being Aksharamanamalai, a long poem by Bhagavan in praise of Mount Arunachala. As Iyer was presenting the books to Gandhi, he quoted a verse from Aksharamanamalai: ‘O Arunachala! Gem of awareness, shining in all creatures low or high, destroy the meanness in my heart.’ Gandhi received the books and later, auctioned the books and gave the proceeds to a welfare fund. The Aksharamanamalai consists of 108 verses and we would like to direct you to the link having the lyrics and translation of the same instead of producing the same here. “During the early years of Sri Bhagavan's abode at Virupaksha cave on Arunachala mountain, Palaniswami and others used to go into town to beg food for the small group of devotees, and one day they asked Sri Bhagavan for a devotional song to sing as they went. He replied that there were plenty of sublime songs composed by the Saints, many of them neglected, so there was no need to compose a new one. However, they continued to urge him and some days later he set out on pradakshina round the Hill, taking a pencil and paper with him, and, on the way, composed the hundred and eight verses. Tears of ecstasy streamed down his face as he wrote, sometimes blinding his eyes and choking his voice. The poem became the great devotional inspiration of the devotees. All the pain of longing and all the bliss of fulfillment are mirrored in its glowing symbolism. The perfection of Knowledge is combined with the ecstasy of devotion. And yet this most heartfelt of poems was composed from the standpoint of the devotee, of one who is still seeking. It is also an acrostic, its hundred and eight verses beginning with the successive letters of the Tamil alphabet. Nevertheless, no poem could be more spontaneous. Some devotees asked Sri Bhagavan the interpretation of some of the verses and he replied: "You think it out and I will too. I didn't think while I was composing it; I just wrote as it came."